A series of fronts and disturbances will move across the state of Colorado this week changing the weather across Colorado. While we expect a bit of a cool down and better chances of rain, we don’t historically see a lot of moisture out of systems that move in from the West or Northwest along the front range. Monday looks pretty nice across the area with mainly sunny conditions but with the approaching front and storm system, expect the winds to pick up in the afternoon hours. Temperatures look to reach the mid to upper 70’s for those of us in and around Castle Rock. On Tuesday a large low pressure system begins to dig down from the Northwest into the California and Great Basin regions. These types of storm systems don’t generally bring a lot of moisture to the front range of Colorado but can mean decent moisture for areas West of the continental divide depending on the track they take. 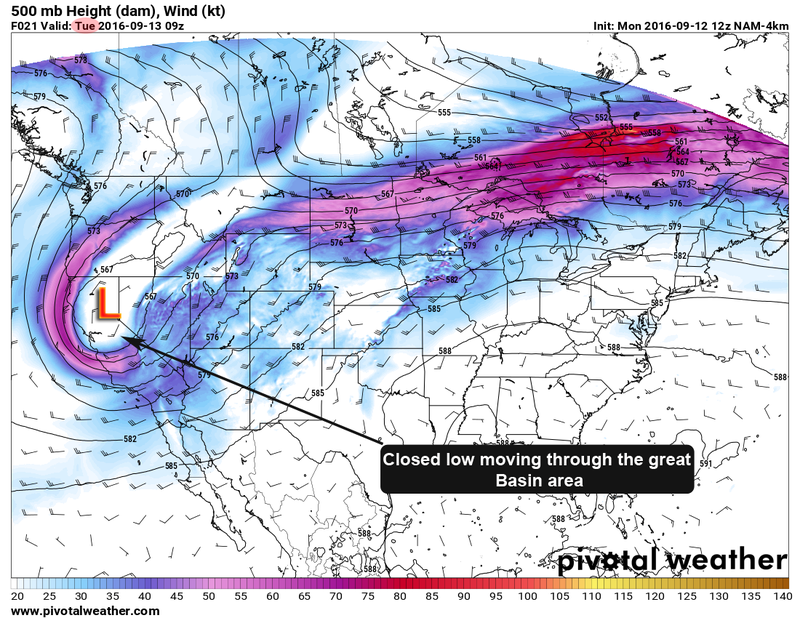 By Wednesday the low begins to lift to the Northeast. Should this model verify (the others are showing similar results) we should not expect an intense or lengthy impact from this storm system. The good news overall with this system is that it will cool us down quite nicely for the week. The bad news is that we will see little moisture from it; the best chances for rain look like Monday, Tuesday and Thursday but none of these days look above a 50% chance overall. Thursday we still have a chance for storms during the afternoon, however it will most likely be a 50% chance at best. 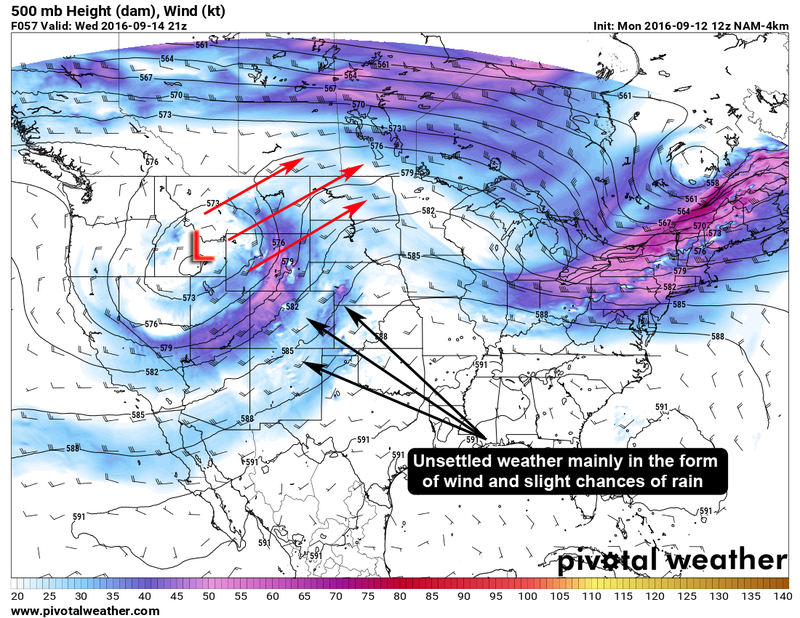 As we move later into the day and over into Friday and through the weekend, we see an interesting pattern emerge. 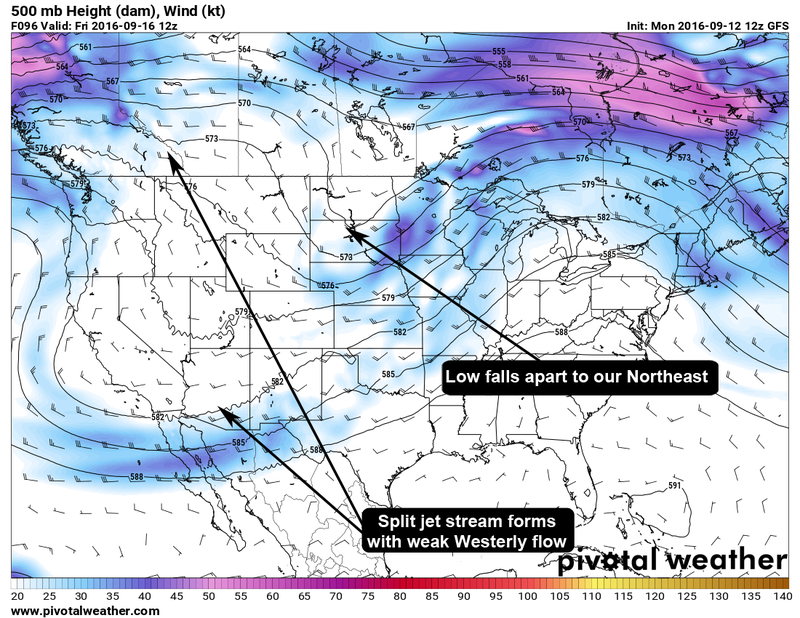 A split jet stream pattern generally means Colorado will stay cool but relatively dry. We tend to see these setups often in the fall and spring months. They keep warmer air from rising into the state from the South but also keep moisture from moving in as well. As such, Friday and beyond looks quite nice in terms of weather. Expect more of those sunny and mild *but not terribly hot* days with cool crisp nights. Clear and cooler, a nice fall day! Overall a great fall week. 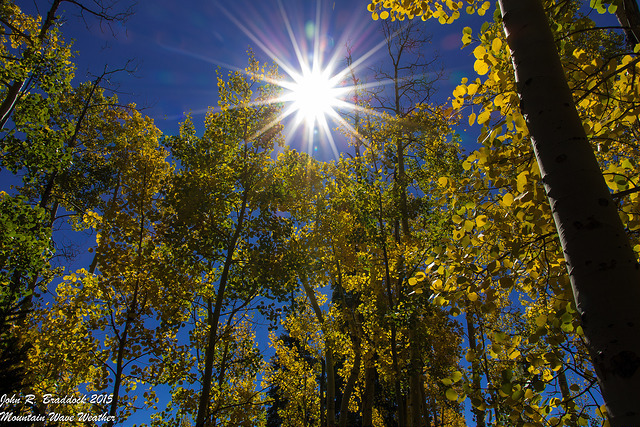 Be sure to get up to the hills to see the fall colors if you can within the next 2-3 weeks. Peak colors looks to be right around 2 weeks out for the Northern mountains and 3-4 weeks for the Southern mountains. Otherwise, have a great week! The colors are changing in the high country and look to be good this year. Don’t miss out if you have the opportunity to see them!